Everybody loves a snack, but when you’re moving towards a whole foods diet, choosing them can seem difficult…or if you’re dramatic (like me), initially it may feel like it’s devastatingly impossible. I’m going to keep this post short and sweet and stick to two key points. For the most part – typical, run of the mill, office favorite and convenient snacks are not healthy. You know this. I don’t care if the Pringles are 30% reduced fat, they are not a natural food. Trust nothing that is delicious and disgusting all at once. Eliminating packaged snacks from your life will drastically decrease the amount of sugar, refined carbohydrates, trans-fats, empty calories and other health hazards – all which directly contribute to disease and weight gain. Snacking on packaged foods may in fact be the biggest culprit in weight loss issues. You just need to keep yourself stocked. Yes, this means going to the grocery store. Always focus on incorporating protein, healthy fat and your biggest friend, fiber. These will keep you full longer. Here’s a list of some favorites that I offer to clients unsure of what to do when the 3:00 snack attack hits. They all just happen to be gluten-free and dairy-free too. 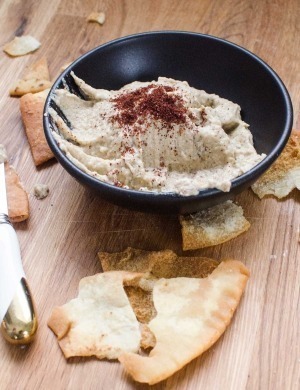 Baba ghanoush, a personal favorite. I also just like to say it. Serve with these guys or veggies. DIY roasted pumpkin seeds and roasted sunflower seeds. These cookies. Use coconut oil or grapeseed oil or ghee in place of butter. Hard-boiled egg (just in case). Chia pudding…so hot right now. Muesli. Another word I love saying. Peanut butter brownie balls Yes please. Homemade protein flax bars. These are famously delicious, I’m sorry but it’s true. Check out this post for my favorite on the go/protein bars. And some other ideas that I’ll let you find on your own: Fruit, raw nuts, rice or lentil crackers with tuna, 1/2 avocado with s&p, almond butter (or any nut butter) with celery, apple, or any vehicle of your choice, hummus with anything, popcorn made with coconut oil and nutritional yeast (YUM).